In a country so steeped in culture and history, it's little wonder that the whole of Flanders is literally dotted with beautiful old relics, architecture and a proud heritage of fine art. Belgium's second largest city is also its most hip and has always been creative: in the 16th and 17th century, it was the great masters such as Pieter Paul Rubens and Anthony van Dyck while in the 20th and 21st century, its fashion designers such as the world-famous Antwerp Six have made their mark. City by the water: The Port of Antwerp is the second largest port in Europe and one of the 10 largest ports in the world. World Diamond Centre: "Antwerp quality" and "Antwerp cut" are international trade terms synonymous with perfect processing and flawless beauty. Visit the Diamond Museum. Onze-Lieve-Vrouwekathedraal: Right in the heart the city, next to the Grote Markt, this is Belgium's largest Gothic cathedral. It contains some amazing triptychs and ' The assumption of the Virgin' by Pieter Paul Rubens. Rubenshuis: The work of local artist Pieter Paul Rubens can be seen in various locations around Antwerp, his home is the city's top tourist spot. is the yearly fashion show staged by the Antwerp Academy, which draws more than 6,000 international visitors. Plantin-Moretus Museum: Close to the heart of the city, this gem is Antwerp's finest museum and, to date, the only museum ever to be put on UNESCO's World Heritage List. The former home of printing pioneer Christophe Plantin. The heart of Bruges, surrounded by an almost continuous ring of canals, is the best preserved example of medieval Flanders. 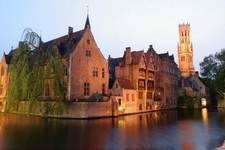 Bruges is also known as 'the Venice of the North', and is the most popular tourist destination in Belgium. Beguinage: Part of the World Heritage Site that covers all the Flemish béguinages, this one is still used for its original purpose, to house single women; unbelievably picturesque, white terraced houses surround a central green that is awash with daffodils in early spring. Belfry Tower: Considered a symbol of Bruges' medieval power, it is worth climbing the 366 steps of this 80-metre-high tower for views over the city. Also part of a World Heritage Site that encompasses all the belfries of Belgium and France. Groeningemuseum: The city art museum renowned for its Flemish Primitives dating to the 15th and early 16th century; artists include Hieronymous Bosch, Jan van Eyck and Hans Memling. Ghent has some fine historical monuments such as the medieval castle of the Counts of Flanders. Its 900-plus listed buildings are testament to the fact that not only did it survive the World Wars pretty much intact, but also that it was a very wealthy city in medieval times, having been Europe's leading cloth producer and largest city outside Paris. Gravensteen: This formidable 12th century medieval castle has been beautifully restored and is still partially surrounded by the moat. St. Baafskathedraal and Belfry: The late Gothic cathedral contains several paintings by Pieter Paul Rubens and Bosch as well as one of the world's great art treasures, Jan and Hubert van Eyck's stunning 20-panel altarpiece, Adoration of the Mystic Lamb. The views from the 14th century belfry are breath-taking. Design Museum: A great range of decorative arts, dating from the 17th century to the modern day, undoubtedly the best design museum in Flanders. Canal Trip: From the canals of Ghent the city's many listed buildings can be admired. Less than a half hour train ride from Brussels, Leuven is home to Belgium's oldest university. As a result, roughly half of the city's 90,000 inhabitants are students, who give the city a lively, informal air. Grote Markt: Including the Stadhuis, built between 1439 and 1468, which is one of the most splendid Gothic buildings in the world and the Cathedral of St Pieterskerk, do make time to pop into Cafe Gambrinus, a local institution since 1896, for a coffee or beer. Great Béguinage: During the Crusades many women were left behind whilst their husbands, fathers and brothers went off to fight the Holy Wars. For protection and company so-called begijnhoven or béguinages were built to house these women. 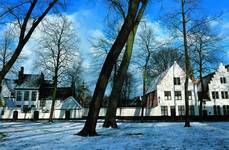 Today, the Great Béguinage houses students and lecturers from the University. 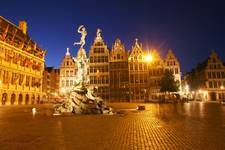 Oude Markt: This square is jam-packed with places to drink and is known by locals as 'the longest bar in the world'. The Flemish coast is something of a secret: along 67 km of pristine coastline lie 14 resorts, each with their own distinct style and character.